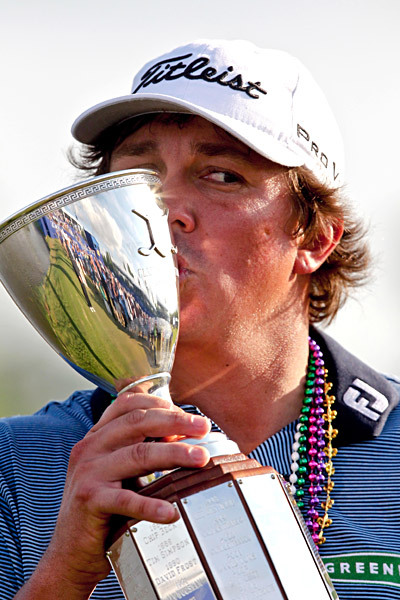 Jason Dufner got his first career PGA Tour title this weekend at the Zurich Classic of New Orleans, beating Ernie Els with a birdie in the second playoff on the par-5 18th. In the first playoff hole, both missed birdie putts within 8 feet of the hole, but Dufner won the second playoff hole by making a short birdie putt after Els missed his birdie attempt. According to our Facebook Poll over the weekend, only about 18% of people picked Dufner for the win. Understandable, as this was his first title in 164 starts on the PGA Tour. Entering the final round on Sunday, the three-time runner-up on the tour had just a 2 shot lead over the field but was able to hang on for the win. Dufner called his win a "great wedding present" for himself and his fiancee -- who are getting married next weekend. He commented that, "[Weddings are] a little more expensive than I thought or had imagined. ...It'll be a big celebration not only for our marriage but also for my first victory out on the tour." Luke Donald shot a 67 to finish in third place at 17 under, and moved past Rory McIlroy for the #1 spot in the official world golf ranking. Defending Zurich Classic champ and 2012 Masters winner Bubba Watson shot a 65 on Saturday, but finished tied for 18th place at -11. Play Free Myrtle Beach Golf Challenge Tournament on WGT for a Chance to Win a Golf Trip! Now through May 31, play in this special tournament from WGT and Myrtle Beach Golf Holiday with two chances to win a golf trip to Myrtle Beach to play golf with "America's Hottest Golfer" Blair O'Neal, host of the Myrtle Beach Golf Buzz and former LPGA and Big Break star. Both the top score and a lucky sweepstakes player, regardless of their score, will each win this amazing prize, which includes airfare, hotel and a round of golf with Blair O'Neal. The tournament, which is available only to residents of USA and Canada, is a FREE stroke play tournament played on Congressional Country Club, the host of the 2011 U.S. Open. A graduate of Arizona State University, Blair became a professional golfer in January 2004 and has competed in a number of tournaments since. In addition to her professional golfer status, she is also a model with experience on runways, print ads, commercial ads, magazine covers and online. In 2008, she was named “One of the Hottest 50 Athletes of All-Time” by Sports Illustrated, and was voted into the final four of its “World’s Hottest Athlete” contest by Web users shortly after. In 2010, Blair was the winner and MVP of Golf Channel’s Big Break: Dominican Republic and received an exemption for the 2011 LPGA Kia Classic. She is now the host of the Myrtle Beach Golf Buzz. You have two chances to win this awesome prize, so start playing now! In this weekly installment dedicated to the upcoming 2012 U.S. Open, which will be held virtually on World Golf Tour, we're taking a closer look at the course that will hold this year's championship: The Olympic Club. Recognized as the oldest athletic club in the United States, the "San Francisco Olympic Club" opened its doors officially to 23 charter members on May 6, 1860 with the purpose “to strengthen and improve the body by gymnastic exercises.” By 1890, the Club fielded its first rugby, basketball, soccer, water polo and lacrosse teams, while continuing to house other sports activities, including swimming and diving, wrestling, gymnastics, handball, baseball, football, fencing, tennis, and boxing. The Club re-built the main City Clubhouse located in downtown San Francisco in 1912, after the 1906 earthquake and fire destroyed the original clubhouse built in 1893. The clubhouse features a fitness center, cardio solarium, handball and squash courts, circuit training facilities, two basketball courts and two swimming pools. In 1918, the Club took over the Lakeside Golf Club, which had just opened in 1917, but was struggling financially. The Lakeside course, located just south of San Francisco on the border of Daly City, is now home to the Club's second historic "Lakeside Clubhouse." Lakeside had one 18-hole golf course designed by Wilfrid Reid, and following additional land purchases the Club decided to expand into two courses, referred to as the Lake course and the Ocean course. To complete the trifecta, the Club added another 9-hole par 3 Cliffs course overlooking the Pacific Ocean in 1994. Today, the private athletic and social club, with its two historic clubhouses and three golf courses stretching down the peninsula, is now simply referred to as "The Olympic Club." Home of this year's U.S. Open championship, the 18-hole par-71 Lake course has been recognized by Golf Magazine and Golf Week as a top 100 golf course in America. Featuring nearly 40,000 trees and almost entirely located within the borders of San Francisco, the Lake course has undergone improvements over the years by architect Bill Love, including new tees and new greens to lengthen the course. The Olympic Club has hosted four U.S. Open Championships over the last century and will host its fifth championship this June. Jack Fleck defeated Ben Hogan in an 18-hole playoff to win the first U.S. Open held at the Club in 1955. Billy Casper defeated Arnold Palmer in a playoff to win the 1966 U.S. Open. In 1987, Scott Simpson won the U.S. Open by one stroke over Tom Watson. Lee Janzen won the most recent U.S. Open at The Olympic Club in 1998. In second round of the 1998 U.S. Open, players complained about the pin position at the 18th hole because the pin was set at the top of a ridge, resulting in many balls rolling way past the cup. The Olympic Club opted to flatten the putting green at the controversial 18th hole in 2000, but it was eventually given more slope in the recent renovation to the course. Visit the USGA site for more information about the 2012 U.S. Open and The Olympic Club, and stay tuned for weekly updates from WGT. 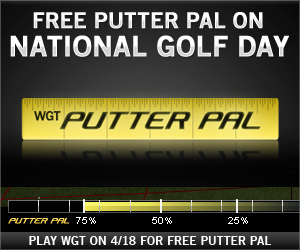 Celebrate National Golf Day with a Free WGT Putter Pal -- Today Only! In honor of National Golf Day, we’re giving away a free WGT Putter Pal to every player who logs in and plays WGT on Wednesday, April 18. You can always improve your putting skills, and the Putter Pal can help you do that with an on-screen ruler in the swing meter to help you putt more accurately. With this WGT gift, try it FREE for your next 100 putts, and you always have the option to turn it off in the Options Menu**. Happy putting! National Golf Day 2012 will mark the fifth annual celebration of the message that golf is more than a game -- providing jobs and being a significant contributor to the U.S. economy. **It’s easy to turn off Putter Pal in the Game Menu, under Options, just scroll down to Putter Pal Display. As we get ready for the 2012 U.S. Open, held this year on The Olympic Club in San Francisco, and virtually on World Golf Tour, we take a look back at the history of this world-renowned championship. The United States Open Championship (U.S. Open) is the second of four major championships in golf, including the Masters, British Open and PGA Championship. It has been conducted by the United States Golf Association (USGA) since it began in 1895. The first U.S. Open was held on the nine-hole course of Newport Golf and Country Club, and played four times in one day (for a 36-hole competition) by ten professionals and one amateur. The surprise winner was Horace Rawlins, 21, the assistant professional at Newport. Rawlins scored 91-82-173 with the gutta-percha ball. The prize money totaled $335, and Rawlins won the $150 first prize. He also received a gold medal and custody of the Open Championship Cup for one year, presented by the USGA. In its first decade, the U.S. Open was conducted for amateurs and the British wave of golf professionals coming to the United States. It wasn't until 1913 that the U.S. Open really took off, when Francis Ouimet, a 20-year-old American amateur, stunned the golf world by defeating famous English professionals, Harry Vardon and Ted Ray, in a playoff. Another surge in the championship's popularity coincided with the amazing career of Georgia amateur Bobby Jones, who won the U.S. Open four times (1923, 1926, 1929, 1930). In 1960, Arnold Palmer scored a record comeback win at the U.S. Open when he fired a final round of 65 to come from seven strokes off the lead, cementing his dashing image. Jack Nicklaus' historic assault on the professional record book began when he won the first of his four U.S. Open Championships in 1962, his rookie season as a professional. Nicklaus, who also won in 1967, 1972, and 1980, is one of only four golfers to win four U.S. Opens. The others are Willie Anderson, Bob Jones and Ben Hoga. In more recent years, the current defending champion from Congressional is Rory McIlroy with an impressive eight stroke victory. Tiger Woods won the U.S. Open in 2002, 2002 and 2008, and Retief Goosen in 2001 and 2004. However, the most famous modern U.S. Open champion may be Payne Stewart, who won the title in 1991 at Hazeltine and in 1999 at Pinehurst. 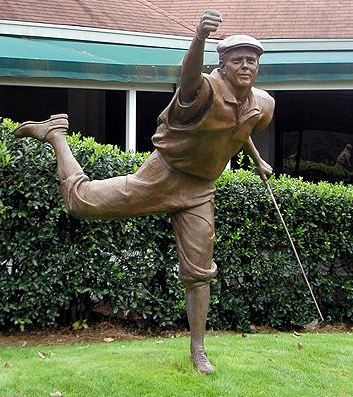 Months later, Stewart died in a tragic plane accident at the age of 42, but his famous winning fist-pump is commemorated in a life-size statue overlooking the 18th green at Pinehurst. Today, the U.S. Open is staged at a variety of courses each year in mid-June so that the final round is played on the third Sunday, which is Father's Day. In the U.S. Open, noted for being golf’s toughest test, par is always a good score and can often be good enough to win. Normally, an Open course is quite long and will have a high cut of primary rough (termed "Open rough" by the American press and fans), undulating greens (such as at Pinehurst No. 2 in 2005, which was described by Johnny Miller of NBC as "like trying to hit a ball on top of a VW Beetle"), and pinched fairways (especially on what are expected to be less difficult holes). Note that the format of the U.S. Open has changed several times. The USGA extended the championship to 72 holes in 1898, with 36 holes played on each of two days. In 1926, the format was changed to 18 holes played each of two days, then 36 holes on the third day. In 1965, the present format of four 18-hole daily rounds was implemented for the first time. The only break in the U.S. Opens since 1895 was 1917-18 for World War 1 and 1942-45 for World War II. To learn more about the 2012 U.S. Open, visit the USGA site for more information, and stay tuned for weekly updates from WGT. 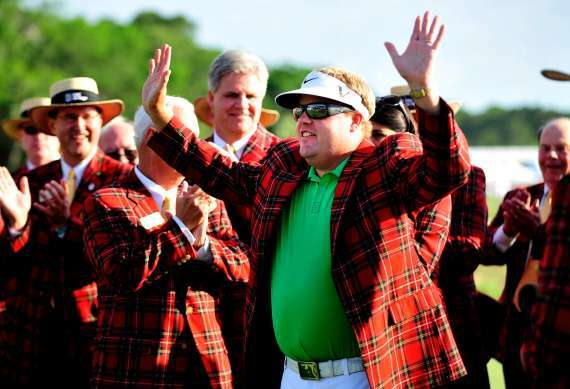 At the RBC Heritage tournament this past weekend at Harbour Town Golf Links, Carl Pettersson fired a 69 for -2 in Sunday's final round, and finished the tournament at -14 to win his fifth PGA Tour title. Pettersson also tied countryman Jesper Parnevik for most ever wins on tour by a Swedish player. During the tournament, Pettersson birdied three of the first five holes, opening with a birdie and adding two more on the par-3 #4 and par-5 #5 holes. Just behind Pettersson was Zach Johnson, the 2007 Masters champion, who was the only rival to make a run for the tournament on Sunday. Johnson answered a bogey at the par-3 #7 hole with a birdie at nine, but took another bogey at #10. A birdie at the par-5 #15 allowed Johnson to pull within three strokes of Pettersson, but Johnson bogeyed the #16 and #18 holes while Pettersson parred #17 and #18 to complete the victory five strokes ahead. Johnson posted a 70 in the final round to finish -9, while Colt Knost's chances for his first PGA Tour title fell apart with 74 for a -8 for the tournament. Top-ranked Luke Donald needed to finish eighth or better to retain his world ranking, but tied for 37th and will fall behind Rory McIlroy in the official world golf ranking. McIlroy initially secured the #1 ranking in March at the 2012 PGA Honda Classic, where he shot a -12 to win the tournament by two strokes over Tiger Woods. Get 3 free Callaway virtual golf balls when you buy $10 or more WGT Credits. These Callaway virtual golf balls are your free with this special offer. Buy credits as often as you want during the Heritage Tournament now thru Sunday 4/15. Callaway's Tour i(z) Vapor Balls are the longest Callaway virtual golf balls giving you more distance on your shots in the tournament. Use your WGT Credits to upgrade your virtual equipment, play in Ready-Go's and paid tournaments, or compete against your friends for credits in Matchplay Challenges, Skins Challenges and the latest Blitz Challenge games. 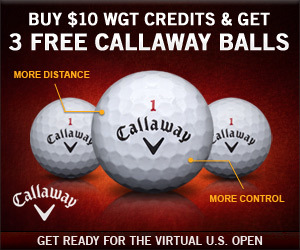 *Offer available only to WGT players buying $10 or more WGT Credits 4/12/12-4/15/12, receive 3 free Callaway's Tour i(z) Vapor Ball virtual golf balls. 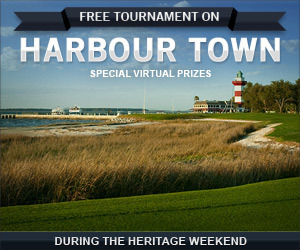 WGT players can tee it up during the Heritage Tournament on WGT's virtual Harbour Town golf course from Thursday 4/12 thru Sunday 4/15. This 9 hole closest-to-the-hole tournament is unlimited play, so try as many times as you want for your best score. The Top 70 scores split an expanded pot of 50,000 WGT Credits! In a heart-pounding sudden death playoff at the 2012 Masters on Sunday, Bubba Watson hooked a shot from the pine straw on No. 10 to defeat Louis Oosthuizen and win his first-ever major golf tournament. Earlier in the day, 2010 British Open champion Oosthuizen produced the first double eagle on the second hole in Masters history, which also launched him into the tournament lead at 10-under. Watson was still four shots back after Oosthuizen made his "albatross" and was able to keep a very good eye on the leader since they were playing partners. On No. 13, Watson made a tricky 6-foot putt that would be the first of four straight birdies. Watson then tied it on No. 16 and after the two made par on No. 17, Watson just missed a 20-foot putt for birdie that led them into the playoffs. In the second hole of the playoffs, Oosthuizen came up short of the green and pitched past the hole, then missed the final putt that could have pushed the playoff to a third hole. In the end, it was Watson's wedge on the second hole that helped him save par and secure his win at the Masters. 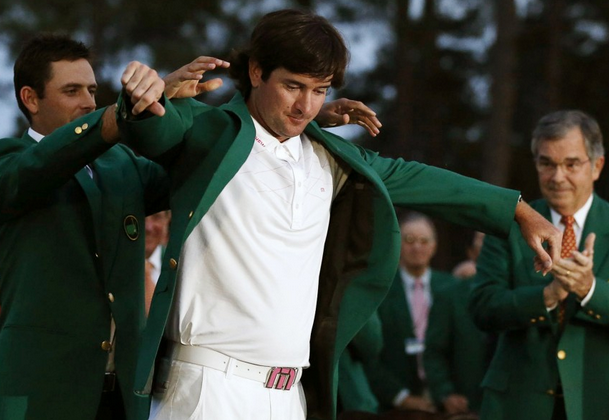 There were several moments that made this year's Masters exciting and spectacular to watch. Peter Hanson had an incredible day on the course Saturday where he birdied five of his last seven holes, shooting seven-under 65 for the day. Hanson finished the tournament 8-under. Phil Mickelson birdied the par-five No. 13 each of his first two rounds, and then buried a 25-foot eagle on the same hole Saturday. Unfortunately, Mickelson essentially took himself out of the tournament with a triple-bogey on No. 4, and finished on Sunday with 8-under as well. Westwood tightened up his game on Sunday with 7 birdies in the final round, but missed several putts and eventually finished 8-under overall. 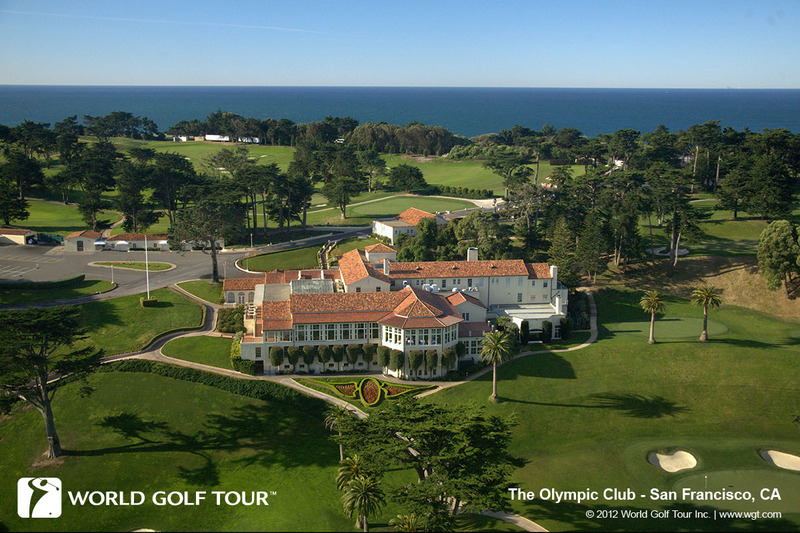 World Golf Tour is excited to announce the release of The Olympic Club, host of the 2012 U.S. Open! 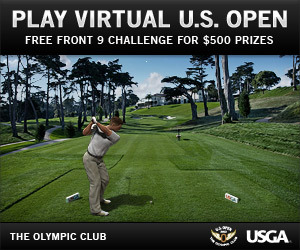 You can now play the Virtual U.S. Open Front 9 Challenge with 9 closest-to-the-hole shots on the first 9 holes of The Olympic Club. New this year, both the best score AND one lucky random player will each win $500 USGA gift card prizes. They Olympic Club is located in San Francisco and has the honor of hosting five U.S. Open Championships, in 1955, 1966, 1987, 1998 and 2012. Now you can experience for yourself the challenges that the Pros will face during the U.S. Open at The Olympic Club in June. The Back 9 Challenge and Full 18 Strokeplay will launch in early May with expanded prizes. Stay tuned for more details on The Olympic Club, U.S. Open and Virtual U.S. Open on WGT over the coming months.